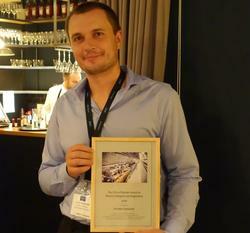 Dr. Jaromír Chalupský, deputy head of the Department of Radiation and Chemical Physics (Institute of Physics of the Czech Academy of Sciences in Prague), was awarded the FELs of Europe Award on Photon Transport and Diagnostics 2018. recognising his outstanding contribution to the development of novel techniques to diagnose non-gaussian pulses of XUV and x-ray light and for his contributions to the study of related ablation and desorption processes. This award was presented in connection with the international PhotonDiag 2018 - Workshop on FEL Photon Diagnostics, Instrumentation and Beamline Design held in Hamburg, 17-19 September 2018. The workshop, which is the fourth in a series, was jointly organised by the FELs of Europe Collaboration, DESY Photon Science, and European XFEL. The award is given to a winner on the occasion of the workshop and comprises of a certificate, a monetary sum of 1000 Euro, and the opportunity to present his results at the PhotonDiag workshop. With this prize, the FELs of Europe Collaboration recognises outstanding contributions in the fields of free electron laser photon diagnostics, photon transport and beamline developments, as well as FEL instrumentation. In 2017, for the first time, the award went in 2017 to Dr. Diling Zhu, a staff scientist in the Hard X-ray Department at the Linac Coherent Light Source (LCLS) in the Stanford Linear Accelerator Center (SLAC), Menlo Park, CA, for his excellence in developing new hard x-ray FEL tools such as techniques in thin crystal multiplexing, a crystal-based split-and-delay unit, a timing tool, and a thin-crystal single shot spectrometer for LCLS. This year, the award was presented for the second time. This year´s award acknowledges Jaromír Chalupský’s insight into the fundamental problem to characterize an XUV/x-ray FEL beam at or in the vicinity of a focus. Due to the extreme fluence levels and strong shot-to-shot fluctuations conventional methods such as knife-edge scans commonly used at synchrotrons fail. More than one decade ago, Dr. Chalupský recognised the potential of the imprint technique for characterisation of focused XUV/x-ray laser beams. In particular, he developed the method to go far beyond just characterising the spot diameter by extending the imprinting technique to non-gaussian beams and to procedures for analysis of the longitudinal intensity distribution (caustic) in focused XUV/x-ray laser beams.